Gymnasium provides basic and secondary education for students of age 14-19. In the year 1993 on the initiative of Vilnius Pedagogical University on the premises of former kindergarten an exclusive University school in the city was founded. Right away the school became the centre of deployment of modern methodology, application of new coursebooks, co-operation of lecturers and teachers, trainee teachers practice arena,and the place where conferences and seminars were held. In the year 1997 the school was reorganized into secondary school and was awarded Simonas Daukantas name. The school had the first graduates in 1999-2000. With the increase of students number, the school premises became too small. In 2001 the school moved to bigger premises in Naugarduko str.7. In 2007 Vilnius “Ąžuolas“ primary school was incorporated into our school. From September 1, 2007 year 1-8 students attend school in Naugarduko str.7, year 9-12 students – in J.Jasinskio str.11. 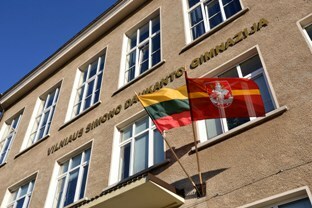 In March 2009 Vilnius Simonas Daukantas secondary school was awarded gymnasium status.